Garnished with raisins and cinnamon, cremita is a luxurious way to finish a meal. Sweet, velvety cremita quickly became my favorite dessert while visiting Puebla, Mexico. It’s a simple custard-like dish thickened with cornstarch. Once home, I longed for a portion of the delicacy and literally squealed when I discovered the recipe in our packet from a cooking class we attended at Mesones Sacristía de la Compañia. However, I quickly realized that several details were missing, and set out to fill-in the blanks by preparing the dish at home. With a little research, and some help from Mom, I was able to nail it on the first try. Mmmmmm… Admittedly, it would have tasted better after a plate of mole poblano, some mescal, and the company of my pals from #WeVisitMexico, but the flavor was there. And it certainly was a hit with my mom and sister who had never tasted the delicacy. Cremita is easy to prepare and is sure to wow your guests and family. I like a simple garnish of a couple raisins and a dust of cinnamon, but it pairs well with fruit as well. Enjoy this recipe based on the version served at Mesones Sacristía (I just added details to the directions). 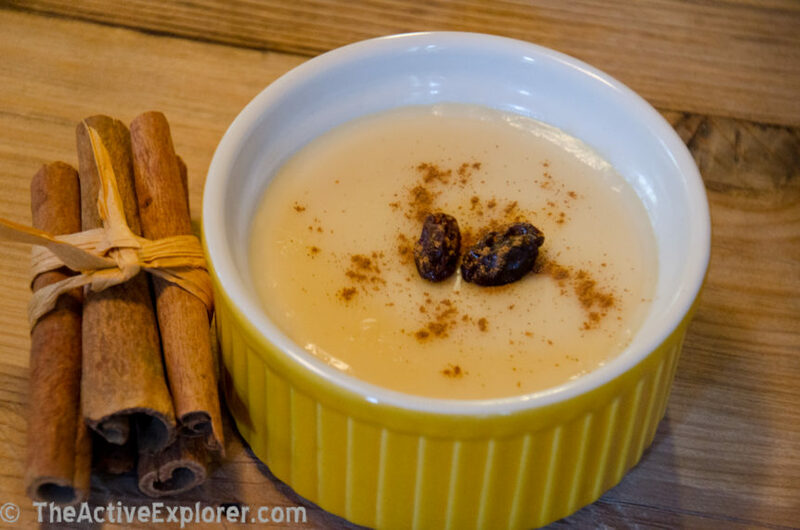 Combine milk, sweetened condensed milk and cinnamon stick. Bring to a boil over med-high heat while stirring continuously. Dissolve cornstarch in water, then add egg yolks. Combine well with a whisk. Return the milk to the heat and slowly add the egg mixture while whisking constantly. Remove from heat and let stand for 2 minutes. Serve in ramekins and garnish with 1-2 raisins and a dusting of cinnamon. Serving tip: A thick “skin” forms over the cremita as it cools. If you don’t care for this, cool the mixture in a bowl, then remove the thick top layer and spoon into the ramekins and garnish just before serving. I suspect this is the method used in the restaurants we visited. This looks AMAZING Erica – I’ll be trying it once I am back in Toronto! Congratulations on nailing the cremita. It looks as delicious as what we tasted in Puebla. I have definitely trying this this week! I miss the food in Puebla.